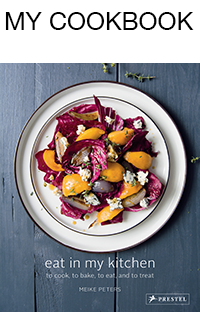 In the past week, I experienced the highs and lows of kitchen life, a fact that a curious baker has to live with when jumping into new recipes. Let’s start with the uplifting experience: I baked 3 cakes and 2 were fantastic, which isn’t that bad. One of them will stay a secret until I share it with you next week, but the other one was this bomb of a cake. It’s a voluptuous beauty, full of flavour, sweetness, crunch, and fluffiness. 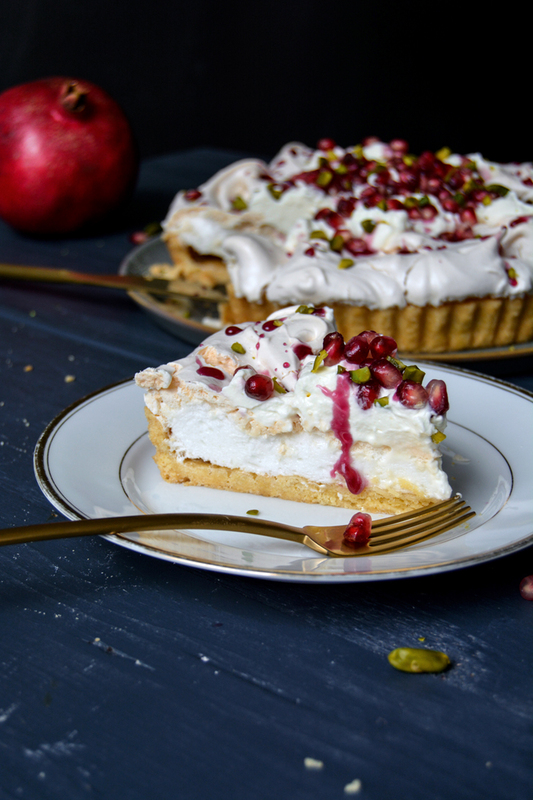 I call it a pavlova tart – not just a pavlova, which never really managed to rouse my excitement. Baked meringue sandwiched with whipped cream can be nice but it’s not enough for me. So I decided to transfer the whole thing onto buttery shortcrust pastry and now it has my attention. 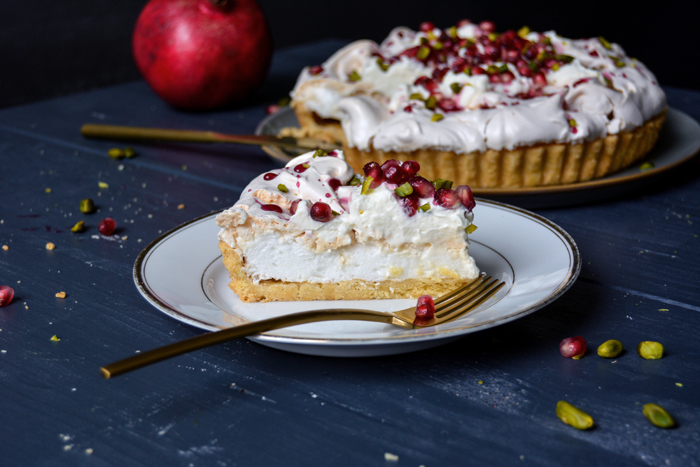 This combination is so good that I believe the pastry base should have been an obligatory part of this sweet classic named after the Russian ballerina Anna Pavlova from the start. But never mind, I’m happy with my new discovery. 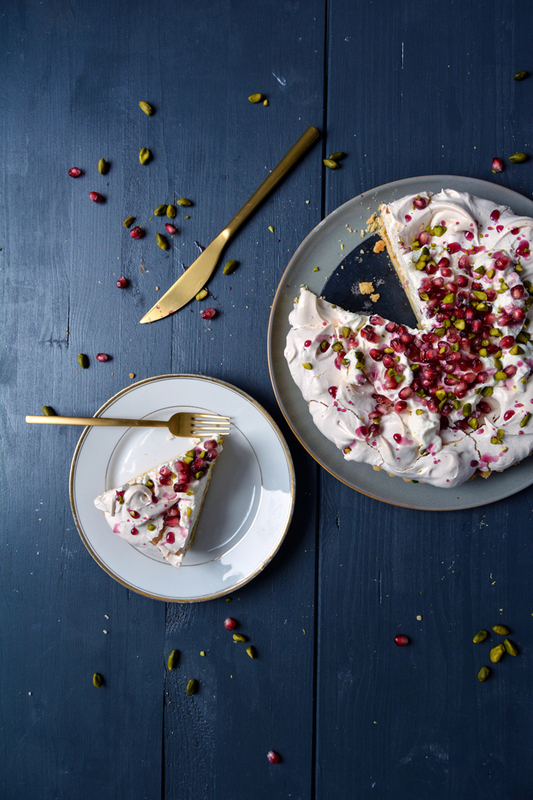 The light meringue is soft in the middle and crunchy on the outside, it’s refined with a hint of rosewater just like the rich whipped cream that crowns the whole composition. 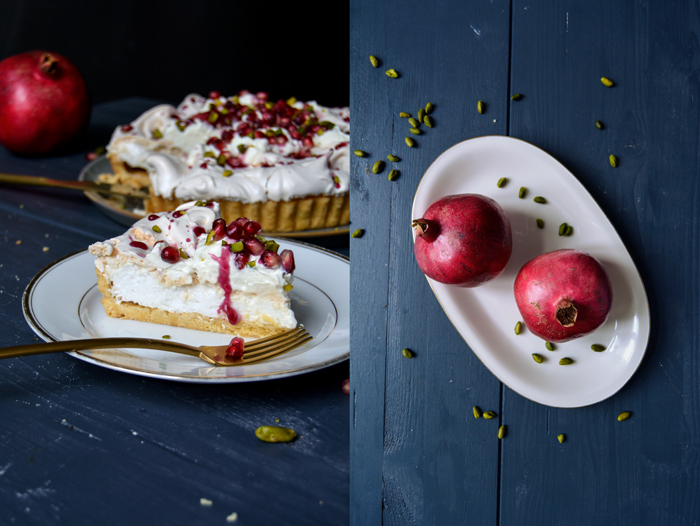 Sweet-sour pomegranate seeds and their juices turned into a concentrated syrup lay graciously on top, side by side with nutty pistachios. Simply wonderful! However, my disappointing kitchen experience was an epic fail – ready for the bin. I decided to give puff pastry a try again and I regretted it the moment I pulled the result out of my oven. I spent 2 days reading about the perfect croissant and up until they were in the oven I was quite optimistic that I’d manage to bake light, crisp apricot croissants, made for a Sunday brunch table. But my hope was destroyed as I opened the oven door and witnessed a rather sad result that looked like my flaky sweets got run over by a truck. 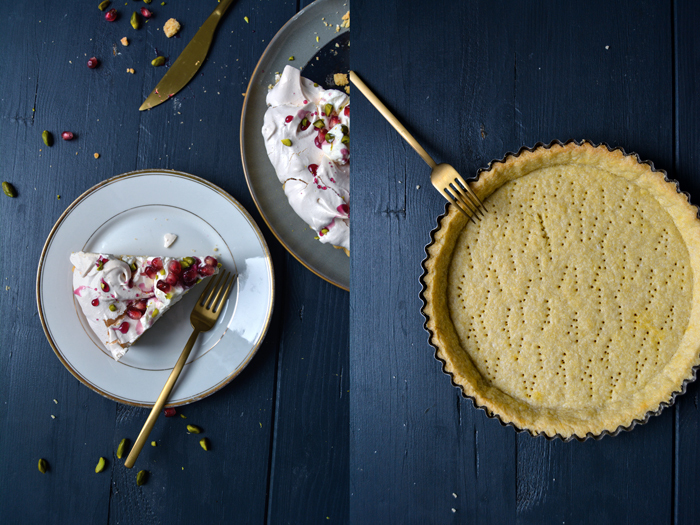 It took me 2 years to recover from my last puff pastry disaster – I tried to make Maltese pastizzi, it’s the flakiest treat, basically the queen of puff pastry – which ended in a buttery, floury soup on a baking sheet. I must say that, this time, it didn’t actually look and taste as bad as my last attempt, but it’s definitely far from making an appearance on the blog. It’s a work in progress I guess. Makes 1 23cm / 9″ tart. For the pastry, in a large bowl, combine the flour, sugar, and salt. Cut the butter with a knife into the flour until there are just little pieces of butter left. Continue with your fingers and rub the butter into the flour until combined. Add the egg yolks and continue mixing with the hooks of your mixer until you have a crumbly mixture; this takes a few minutes. Form a thick disc, wrap in cling film, and put in the freezer for 12 minutes. Preheat the oven to 200°C / 400°F (conventional setting). Roll the dough out between cling film and line a 23cm / 9″ tart pan with the flat pastry. Prick with a fork and bake in the oven for 12 minutes or until golden and crisp. Take the pan out of the oven and let it cool completely. For the meringue, in a large, clean bowl, using an electric mixer, whisk the egg whites and salt for 1 minute. Continue whisking for 10-12 minutes, adding 1 tablespoon of the sugar at a time. 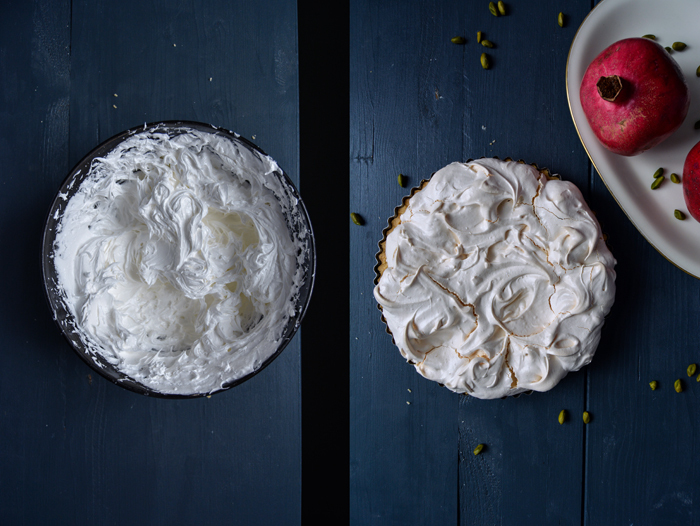 The meringue should be stiff and glossy. Whisk in the cornstarch, vinegar, and 1-2 teaspoons of the rosewater. Add more rosewater to taste. Turn the oven down to 180°C / 350°F. Scoop the stiff egg whites onto the pre-baked pastry, spread it lightly but don’t push it down. Swirl it a bit for an uneven surface. Bake in the oven for 5 minutes, then turn down the heat to 135°C / 275°F and bake for about 60 minutes or until the meringue is light golden and crisp. Switch off the oven, open the door slightly, and leave the cake in the oven for 15 minutes. Take the cake out of the oven and let it cool completely. In a medium bowl, using an electric mixer, whip the heavy cream and 1 teaspoon of the rosewater. Add sugar and more rosewater to taste; set aside. 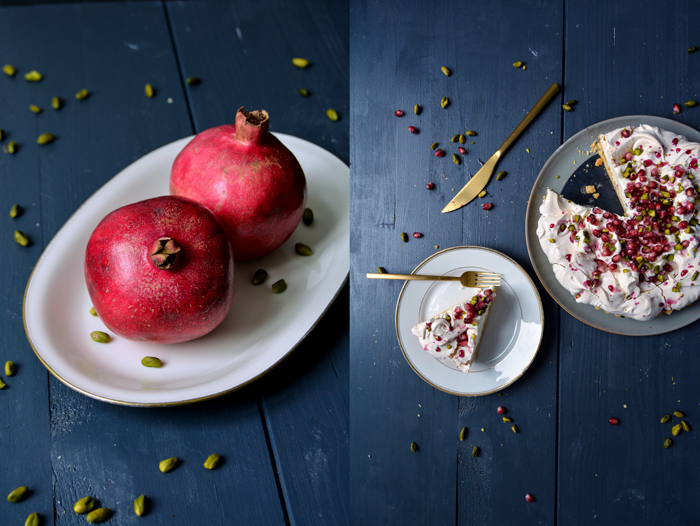 In a small saucepan, bring the pomegranate juice and 1 1/2 tablespoons of sugar to the boil. Cook for 1 1/2 minutes or until it starts to thicken. 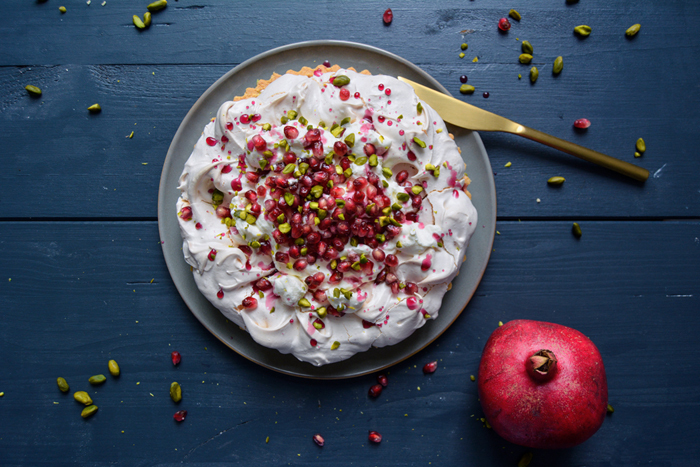 To assemble the tart, spread the whipped cream in the middle of the meringue, leaving a wide rim, drizzle with the syrup, and sprinkle with pomegrante and pistachios. Fails in the kitchen can really hit my confidence as a cook, not to mention it is such a painful waste to bin stuff that it’s inedible. It’s definitely a work in progress. But the tart worked, right? Looks wonderful. Oh my god! This is just the most beautiful thing ever!! 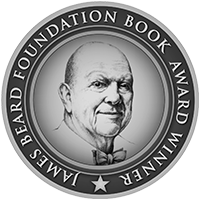 I just have to master pastry making and it’s on! Thank you Lucy! This cake is far less complicated than it actually looks 🙂 Have a nice Sunday!